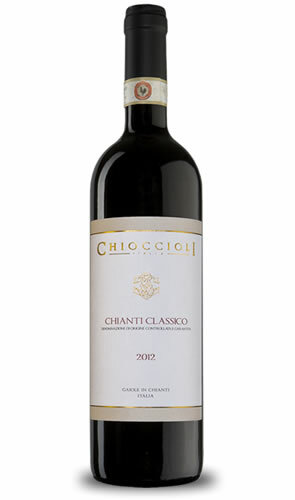 Chioccioli Chianti Classico Italian wine. L&P Global. Chianti Classico DOCG. Italia - Gaiole in Chianti and Quercegrossa. Blend of 85% Sangiovese, 10% Merlot and 5% Cabernet Sauvignon. After a thorough green harvest, the grapes are hand-harvested, cooled overnight. Fermentation takes place in small stainless steel tanks, conical vats. After a long marceration on the skins the wine is poured directly into French oak barrels. It rises in barriques ”sur lies” for 14 months. After bottling it also ages in bottle before being released in the market. Wine of extraordinary identity, fairly intense with fruity, floral and spicy notes, balanced and concrete tannin with a fresh acidity that extends into fruity and spicy notes. It goes very well with meat dishes such as ossobuco, leg of lamb, lamb chops, roast, wild duck, venison and pizza with meat. As for the cheeses it fits well with young or semi-mature cheese and Italian Taleggio.